As the official website chooses to say, Asva is “coined from the Sanskrit word ‘ashva’, the name Azva symbolizes the seven vows every couple takes/says on their wedding day.”Designer Wendell Rodricks has created designs for the Azva collection which he states is very contemporary for the modern bride. During Amby Valley bridal fashion Week, Azva, the gold brand showed beautifully crafted designs on the ramp. There was this beautiful double chain white pearl and gold necklace worn by a supermodel which attracted most of the attention. 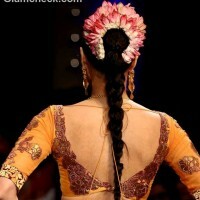 There was another piece of jewellery that was flaunted on the ramp and that was the maang tika. With these sets of jewellery, Azva brought back not only history but also modernized the way brides deck themselves up in gold. With the Indian wedding season just around the corner we bring you a couple of jewelry suggestions from Azva’s collection. Fuschia Pink bootidar sari with a light orange blouse with intricate golden floral designs set the background for the Azva pearl jewellery. The off white pearls were set in a 22- carat gold brooch shaped haar which exuded elegance and a cocktail vibe. It is very apt for the sangeet ceremony or the reception. The necklace flaunted fuschia pink colour over gold and that made all the difference. It was pretty, ornate and beautifully carved. With the times changing, traditional meets contemporary and that is how I can explain this florette design. It is warm, gold and all things traditional with a contemporary twist to it. Beautiful in its shape and form, the gold choker necklace with floral designs and ruby droplets was a splendid catch. It was combined with a three row gold necklace which touched the waist of the model. 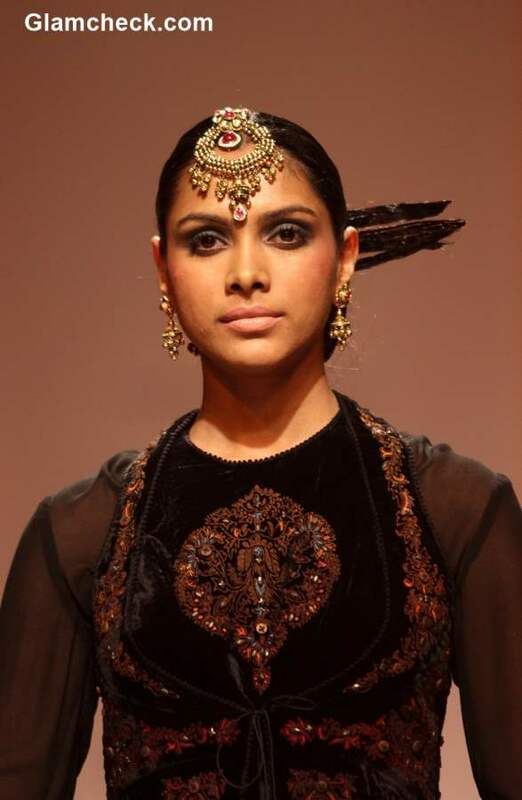 This piece of art was styled with a red lehenga and black and gold embroidered blouse. A huge maang tika suggests that traditionality is still at the top, but a minimalism ruled in the styling of the garment. The maang tika was done in ruby, gold and ofcourse polka diamonds. It had a big round shape with rubies hanging from the top. This over sized maang tika was worn with a black embroidered kurta with red embroidery at the centre and a sheer sleeve jacket with red borders tied at the breast. 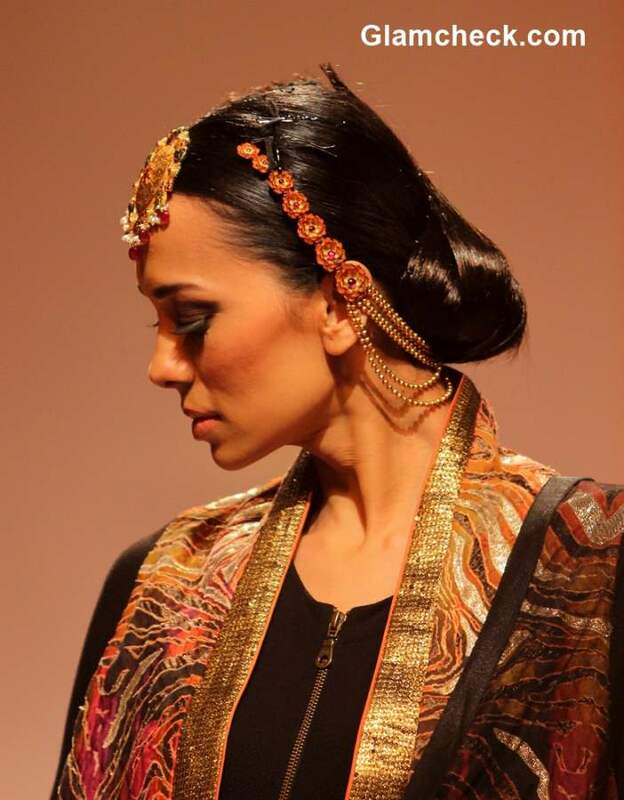 The maang tika was matched with true gold earrings or jhumkas for the mughal feel to it. With gold jewellery being showcased at the top, the fourth ensemble was matched with a beautiful mangtika and floral head band gold jewellery which covered the bun and the hair. This hair accessory ruled the roost and was covered with strings of pearls and flowers. 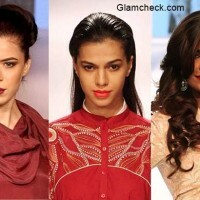 The makeup was simple with lip shades varying from light to dark maroons, pinks and matte gold. Eyes were smoky and that made all the difference. As the price of gold rises, this collection is hard to miss! In the summer of this year, style your cocktail saris with these Azva creations and look your best. You can always wear a contrasting colour blouse with your bright pink sari and wear a choker with it. Or you can wear a chiffon sari in black and style it with a mang tika while keeping the look bare. This tradition meeting modernism which was so profusely bleeding in this collection was a toast to look up to. It was well put together and carried all the stuff that you would need for a cocktail party. 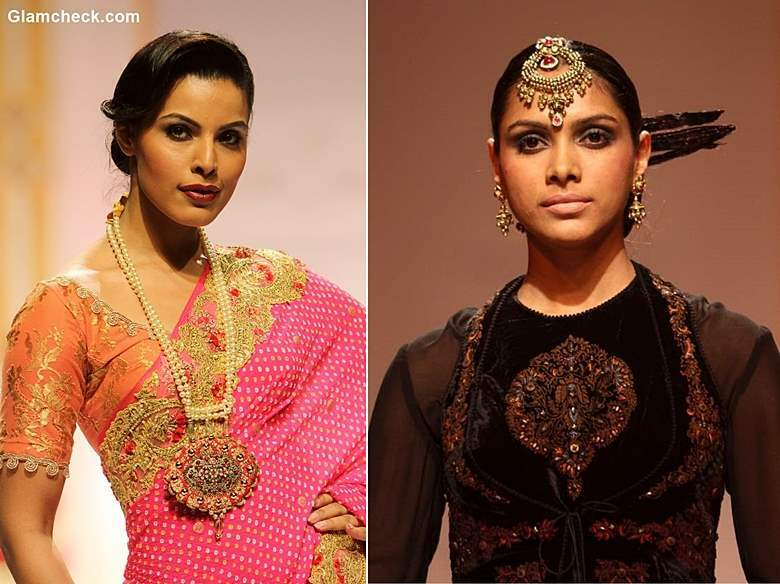 You can even wear one of these pieces to an elaborate sangeet or mehendi ceremony. If you are the bride, then fret not as these pieces of exquisitely crafted jewellery will bring you a host of compliments. Colour your lips maroon and apply bronzer on your cheeks. Also do not forget the smokey eyes and the all responsible lip liner and you are done for the ceremony. Have a look at yourself in the mirror and get ready to shower yourself with compliments.